This happy symbol stands for the music in our hearts; the songs we belt out spontaneously, the waltzes we snuggle to, the carols we subject our neighbours to, the concert that nourishes our souls and that soundtrack (yes, admit it) that we all have playing in our heads for most of the waking day. Studies show that listening to classical music has a healing effect on the mind, body and spirit. 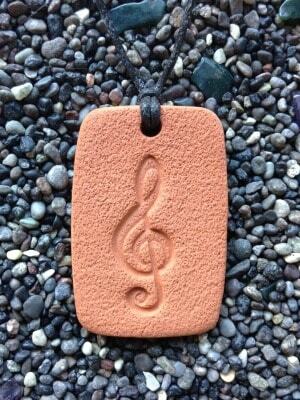 The Spirit of Music Pendant measures 2.7 cm by 4.2 cm (1 1/8 in by 1 7/8 in).